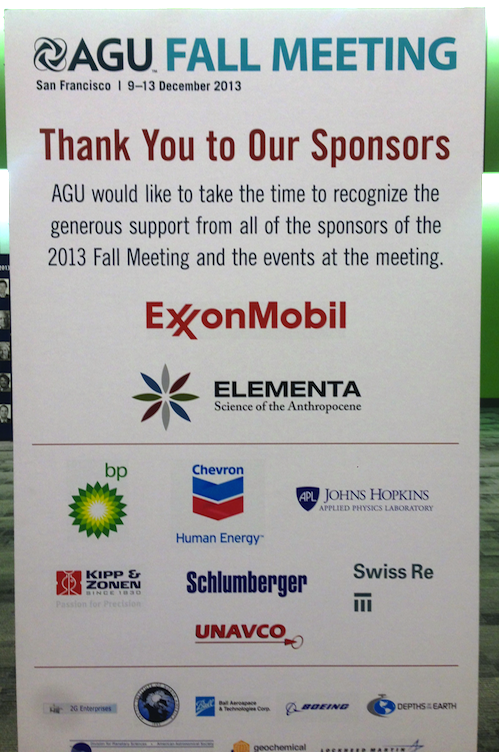 AGU would like to take the time to recognize the generous support from all of the sponsors of the 2013 Fall Meeting and the events at the meeting. The top sponsor credited was ExxonMobil; second-tier sponsors included BP, Chevron, and drilling services giant Schlumberger. The prominent “thank you” given to the companies that profit from the disruption of our climate system received condemnation from some public commenters. “Nausea-inducing greenwashing: Pukewashing,” tweeted climate and energy blogger Lou Grinzo. “The cognitive dissonance is mind-boggling,” wrote geology student Ryan Brown. Hill Heat sent email messages to the members of the AGU panel asking if they had concerns about AGU accepting funding from the fossil-fuel industry, including companies that have an extensive history of funding attacks on climate science and political opposition to the regulation of carbon emissions. Many AGU members work in the oil and gas industries as well as the coal industry. I suppose the AGU could be corrupted by these elements, although I have no evidence (that I know of) of this having happened in the past. AGU Committees I have served on have shown no evidence of nefarious inputs or pressures. Usually, the first meeting of an AGU Committee there is a conflict of interest session in which all tell of any matters that might be construed as a conflict of interest. This was the case with the Committee I chaired. Fellow panelist Kevin Trenberth, Distinguished Senior Scientist in the Climate Analysis Section at the National Center for Atmospheric Research in Boulder, Colo., related a similar sentiment to Hill Heat. According the AGU Fall Meeting Sponsorship Prospectus, “Sponsorship at the AGU Fall Meeting is a cost-effective way of branding your company, your products, and your services to more than 20,000 geophysical and space scientists.” The prospectus notes that “Sponsorship can increase your corporate/product awareness, build your brand, and create positive link in the attendees’ minds between you and an activity in support of their science.” The top “gold” sponsorship level costs a minimum of $15,000. The AGU conference also advised climate scientists on effective communication, with presentations such as “400ppm CO2 : Communicating Climate Science Effectively with Naomi Oreskes and multiple presentations by John Cook, Stephan Lewandowsky, Susan Hassol, and Dana Nuccitelli.